We are your premier source for today's hottest styles. Whether you are looking for formal wear, casual wear, or accessories, we carry the latest fashions at an affordable price. Our unique inventory and low overhead allow us to offer a one of a kind shopping experience. 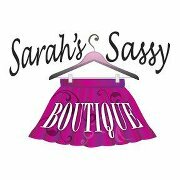 It's no wonder so many satisfied shoppers count on Sarah's Sassy Boutique for all of their fashion needs!